I burned this the first time I made it. HUGE mess in my Instant Pot and it took me forever to clean it out. Thankful for stainless steel inserts that stand up to a good scrubbing. The first time around I had too little water, and I used tomato paste which is tricky to use in a Instant Pot. But it’s difficult to give up on the lure of a comforting chicken and rice dish. 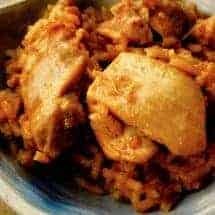 My Indian version, the Chicken Biryani I created, is one of my favorite Indian dishes. I just don’t love the hours it takes and the very many dirty dishes it creates. My streamlined version took care of that issue. So for Mexican cooking week, I certainly had to have a chicken and rice dish, and of course it had to be Arroz Con Pollo. The second time I tried it, I made only the rice, to ensure I could get that right. I’m posting that separately as Mexican Rice here. The third time I tried it, I was ready to add chicken, and it worked out well. Cook HP for 6 mins, NPR 10 minutes, release remaining pressure. Meanwhile turn your Instant Pot to Sauté and when it's hot, add in 1 tbs of oil. Add in the rice and sauté until the rice is translucent about 3-4 minutes. Add the chicken and the cumin, Goya Sazon and salt, and cook for a minute or two to let the spices bloom. Add in the blended vegetables and the water, seal the Instant Pot, set to Manual HP for 6 minutes. Allow it to release pressure naturally for 10 minutes, and then release any remaining pressure. Serve with a tomatillo salsa for a little piquant flavor. Hi Urvashi, Thanks so much for your recipes! I was going to try this one, but after reading the comments, it seemed you were still kind of working on this. Is the recipe currently on this page a corrected one, or is this still a work in progress? I need to take this one off! Look for one that says even easier Arroz con pollo. That’s the one you want. I just made this for dinner and it came out pretty well! There was a touch too much liquid – maybe I used bigger tomatoes than you did? We don’t tolerate spice well, and DH hates cilantro (crazy, I know!) so I left out cilantro and jalapeños. The flavor is good, just not strong enough – maybe tomorrow it’ll perk up a bit more! Thanks for all your hard work and tasty recipes! Without the jalapeños and cilantro you are definitely going to be missing the major flavor elements for deep flavor. I wonder what else you could add to perk it up? I always despised chicken thighs until I tried them in this recipe–they taste delicious in this! This is one of my favorite IP recipes. I often use canned tomatoes instead of fresh–works great. Hello. Love your recipes! I made this tonight and it was really soupy. It happens all the time when I make rice and chicken recipes in instant pot. Too much liquid. It was a blending of the 1.5 cup of water and liquidy blended veggies. Should the blended veggies have been chunks? No it shouldn’t have been chunks, blending was the right thing to do. Hmm. What kind of rice did you use? The thing is, I made it with 1 c water following same logic you did. It burned. I posted in the IP forum and everyone said, too little water because the veggies cook down and need water, plus I had tomato paste. So then I tried with 1.25 c water and no tomato paste. Still burned. So I did with 1.5 and putting chicken on top and it didn’t burn. But I used long grain basmati, and I also let it steam after it was cooked. Ok. I also used basmati. I didn’t change anything from the recipe. My blended veggies were basically all liquid. I blended it down that much. I couldn’t even put the chicken on top because they sunk down in that much liquid. Maybe it’s my instant pot. I will just use less liquid next time and experiment. Thanks! No I don’t think it’s just you. I may need to retry it. Actually two other people are going to test that so I’ll get more feedback. Based on your experience, how much water do you think it will take? I may just try 1.25 to 1.5 cups of total liquid and see what it’s like. I honestly don’t know though. Thanks for your help. I really do appreciate the feedback. Thanks for letting me know. Hi! Finally had time to make this. It was a bit mushy for me too. More like a risotto. But it may be that that is how rice recipes come out in the instant pot. I thought it needed a tiny bit more flavor but I did notice the next day the flavor became stinger ! Ah good feedback. I will remake with less water and try it. Can I cheat and just toss some pico de gallo in the processor for that first step? probably 🙂 I like that idea. This looks so yummy and easy. Please advise on one idea, If I wanted to use chicken drumsticks how long would I cook for?? I’d suggest about 8 minutes. I’m a little concerned about the rice overcooking during that time but maybe not. It’s super easy.